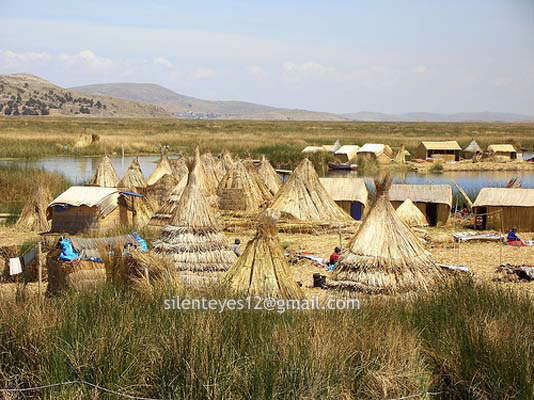 The Uros people of Lake Titicaca have a unique way of life - they build their own islands, float them on the lake and then proceed to live on them. Here is a glimpse of their world, where their homemade "islands" are truly "in the stream". Floating islands? 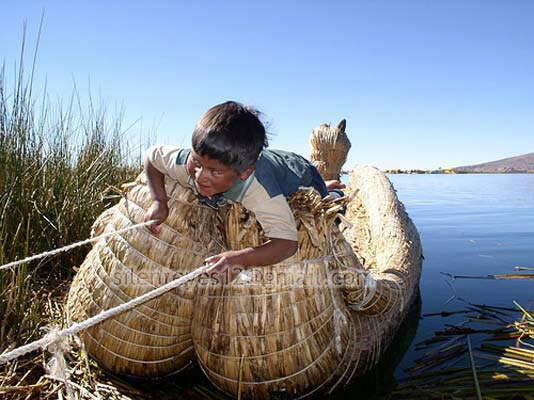 It may sound like something out of a Jonathan Swift novel, but to the Uros people it is a fact of every day life. This small tribe of South American indigenous retain a great deal of a culture that goes back millennia and one whose unique domestic arrangements stem from that age old fear - the dread of suppression by other, stronger and more populous peoples. 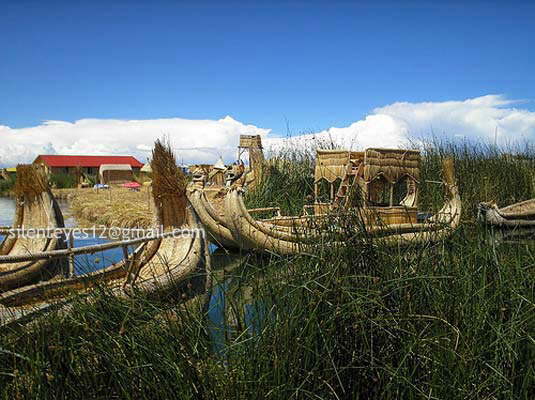 Lake Titicaca itself affords a deal of protection. Isolated and over three thousand meters above sea level, the lake itself offers - simply by its relative isolation (even in modern day Peru) - some protection from the unwanted attentions of others. 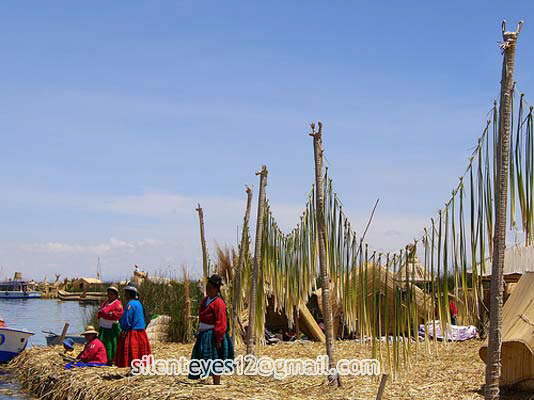 However, at some point before recorded history a member of the Uros had the bright idea to do something extraordinary with the reeds that grow prolifically along the banks of the lake - the largest in South America (by volume). The reeds themselves are malleable enough to dry out, bundle and shape in to extraordinary boats which float quite nicely. 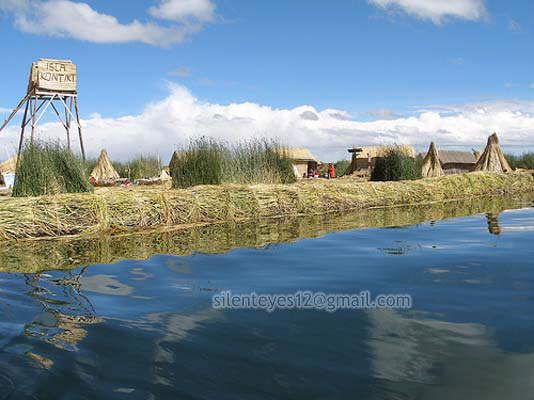 With a leap of the imagination, the original Uros saw the possibility for a system of domiciles which, in case of emergency, could be moved away from the mainland. Although they only number in the low thousands, it is thought that around five hundred of the Uros still choose to live in this ancient manner - though with some concessions to the modern world! 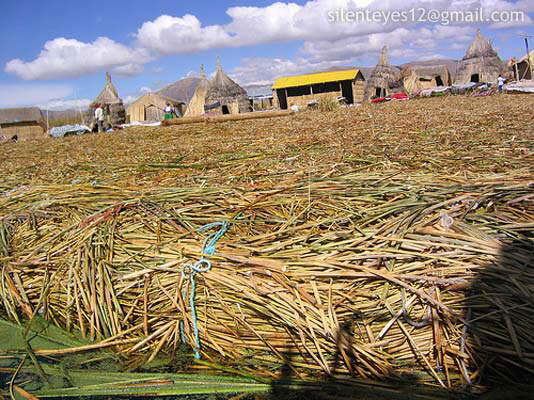 The tortora reed islands are meticulously created by hand and are a continually evolving habitat for the Uros. Although the reed used for the island is not as painstakingly 'woven' as that used for their boats, the construction of the islands represents an enormous workload for the people of the tribe. 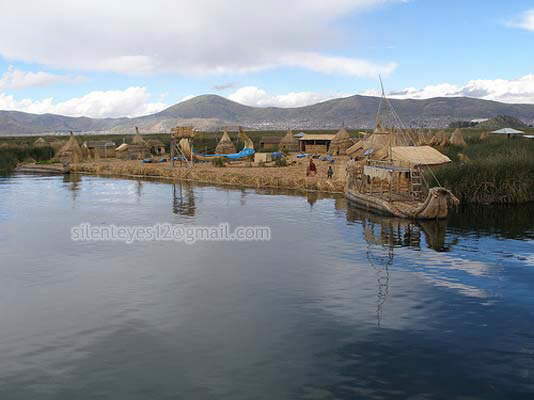 The islands themselves must be several meters thick in order to support the homes and associated buildings of the Uros. The tortora has interweaving roots which create a dense layer (up to two meters thick) on top of which the islands themselves develop. Anchorage is provided by drilling large logs through the island to the base of the lake. Ropes are then attached to these logs to give the islands stability. Even so, the reeds constantly rot away and the islanders must replace them constantly. Each island will go through this process at least four times a year - more when the rains come. However, there is reward for all of this hard work as each island has a lifespan of around thirty years. Traditionally there are around forty small islands on the lake with one - the largest - being the focal point of the community. The reed, as well as being - quite literally - the foundation of the community, is important to the Uros' economy and well being. Iodine is produced from the base of the reed and it is also used for general medicinal purposes. The reeds are wrapped around parts of the body that are hurting and, purportedly - cure it of its aches and pains! 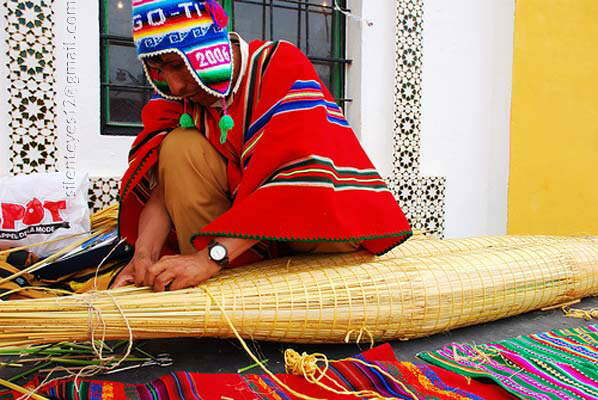 Like many unique cultures around the world, that of the Uros is under threat from assimilation. 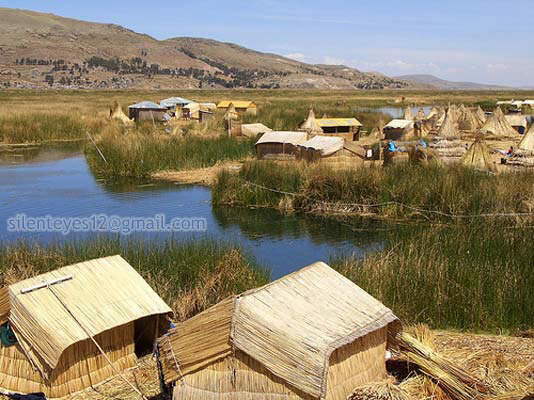 Most of the Uros speak Aymara - which is the language of a larger local tribe that is resolutely mainland. It is thought that they lost their own language around five hundred years ago. Whether the language was naturally lost or Aymara was forced upon the Uros is not known, but the relatively recent arrival of Europeans has been the greatest threat to their cultural identity - greater than that of the Inca Empire - to which the Uros had to pay taxes and give up many of their own people as slaves. Although numerically a small people, the Uros seem to have adopted the aspects of European society which suits them. Many of them use solar panels on their reed homes to run television sets and other electronic appliances. The largest of the islands has a radio station which broadcasts for several hours each day and the concept of group education for the children in the form of two schools has also been adopted. There are not, however, any modern cookers on the island so the question naturally arises of how the Uros cook without setting the reeds on fire and destroying their home! What they do is to create a pile of stones high enough to create a fire on top without the heat being strong enough to start an inflagration. Another question which is also always asked is how do the Uros ensure that their island remain sanitary, with several hundred people having to answer the call of nature. They do this by creating very small island near the larger ones which are used only for this very specific purpose! The waste is absorbed by the tortora reeds and helps towards the next healthy crop! 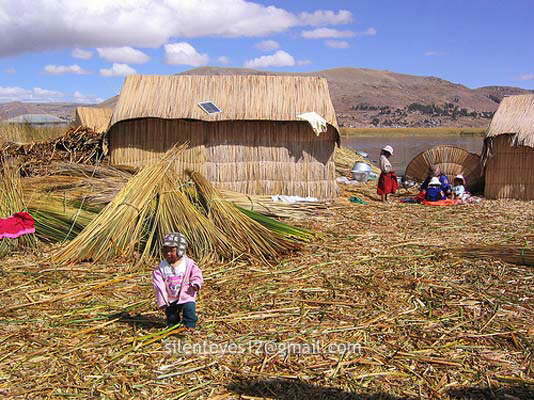 In order to sustain their meager economy the Uros also must accommodate the large amounts of curious tourists who are drawn to these forty or so islands to observe this unique way of life. Many Uros family have a room in their home which is dedicated to tourist usage and guests are welcome to stay overnight. Few concessions are made to the tourists in terms of what might be called mod-cons but there is a traditional dance every night, when the tourists are encouraged to dress up in traditional Uros dress and join in. 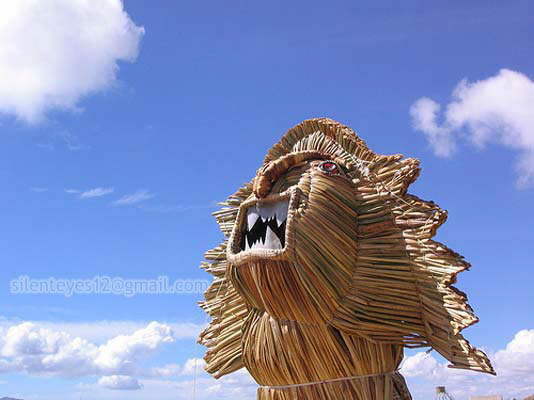 One suspects that the Uros may well look upon this is a quietly done practical joke on their westernized visitors! It can only be hoped that this small, unique and vibrant culture can survive the demands placed upon it by external forces. Certainly it would be a shame if the world was to lose yet another intriguing and vital, if tiny, aspect of humanity to the ogre of global homogenization.